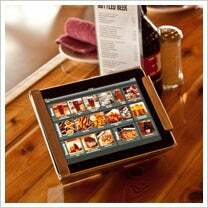 Forget table tents, at Scott Wise' Thr3e Wise Men pizzeria, iPads serve as menus. The iPad 2 may be on many consumers' wishlists, but should you buy in? Some entrepreneurs may be on the fence -- perhaps deterred by the up to $829 price tag or the up-to-five-week wait. Others may think the Apple device is overhyped and not as useful as some say. Berkeley, Calif., bakery Cinnaholic uses iPads instead of cash registers. When Shannon Radke and her husband Florian launched their upscale Berkeley, Calif., bakery, Cinnaholic, they bagged the old $3,000 and 100-pound cash registers for two $600 iPads affixed to docking stations. They can process cash and credit-card transactions by way of Square, a free app and reader that turns the gadgets into credit-card payment systems with no contracts or merchant account required. Though cash purchases can be processed for free through the Square app, credit-card transaction fees, which range from 2.75% to 3.5% plus 15 cents, still apply. If Steve Jobs calls the iPad 2 Apple's "third post-PC product," Scott Wise calls it a menu. At his Thr3e Wise Men pizzeria and brewery, which opened in January, the restaurateur installed iPads on the tables to allow diners to view the menu, the company's website and videos. DJ and producer Rana Sobhany knows a good beat when she hears one, but she's also pretty quick with technology. Using iPad apps like Groovemaker House and Pianist Pro, the New York City DJ is able to weave together seamless beats using just two iPads. She told Switched that the iPads, which set her back $1,200, are cheaper and easier to transport than typically clunky DJ equipment. What creative business uses have you seen -- or would like to see -- for the iPad or other tablet? Leave a comment and let us know.